Easy Homemade Dog Treat Recipes and Biscuits! Your Puppy Will Dance For! 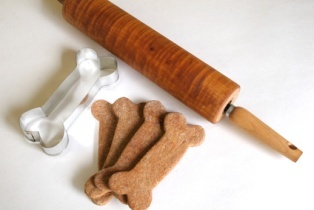 We've put together a variety of homemade dog treat recipes for you here at love my puppy dog. Enjoy the fun of making homemade dog treats, snacks, cookies and dog birthday cakes for your puppy. Get the entire family involved making home made dog treats in every shape and size! Your pooch will love you for it! Shoot he might even slobber all over you AND the homemade dog treat just out of sheer joy and happiness! I know our girls do. When our girls, Annie and Nikki, smell the tantalizing aroma of me making their homemade dog treats they start hovering around the kitchen watching me with those big brown eyes of theirs. And as soon as I pull out a cookie sheet of tasty dog biscuits, they jump up just begging for one. . . so yes I give in and they each get not one but TWO tasty treats! Ok, maybe three..but that's it! It's easy to make the best home made dog treats your dog will love because they will come directly from your kitchen and your heart. Ok so maybe you have never baked for your dog before, but don't let that stop you! It's really just like making cookies for your kids, just with a few different ingredients. The best part is you make all the decisions as to what goes into your dogs' treats. No more worries of what those store bought brands are grinding up into your dogs treats. I'll be taking you step-by-step on how to make everything and what ingredients to avoid. Some ingredients can make your dog sick and some can actually kill your best friend. All my recipes are pretty simple and easy to make and are designed for those of you who have very little baking experience or little time. My kids love to decide what dog treats we are making and what shapes they are going to be cut in. Dogs come in every size and so do their little bellies. When you are creating your puppies yummy treats you can cut them into sizes that fit your puppies needs. You can find all different sizes and shapes of dog cookie cutters. But don't worry, if you don't have any cute doggie cookie cutters when you make your first homemade dog treat recipe, just go ahead and use any basic cookie cutter you might have at home. My kids and I have a blast choosing what shape we will cut the dog biscuits into. It might be hearts for Valentines Day, Christmas trees for Christmas, flowers for Spring, Turkeys for Thanksgiving, the ideas are endless, so have fun with it! Just make sure that the size of the cutter fits the size of your puppy. Hey and if you don't have any cookie cutters at home, no problem, just roll the dough in between your fingers into a log shape, voila' you just made a dog biscuit! There's No Limit To Your Imagination! When you start baking homemade dog treats you'll see there is no limit to your imagination as to what flavor or shapes you can make. 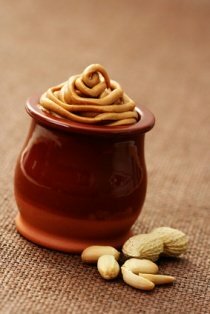 One of the very favorite flavors of dog's is peanut butter dog treats. Why not start out with one of our girls favorite homemade dog treat recipes, Peanut Butter Banana Carob Bites or Peanut Butter and Oats Biscuits. Our girls give 'em 4 Paws Up! Once you get a few homemade dog treat recipes under your belt, you will be able to start customizing ingredients in your treats that get that tail waggin' response. Every time I open a peanut butter jar just to make a PB & J, my dogs are right there waiting anxiously, drooling. Just too funny. If your in the mist of training your brand new puppy basic commands, tricks or doing some agility training, your gonna need some scrumptious treats to coax him. This is a great time to try out your hand at one of our homemade dog treat recipes such as dehydrated liver. This is a very inexpensive, and healthy dog treat. Try buying dog training treats out in the store and your gonna pump out some big bucks believe me. It's much cheaper and healthier to use one of my homemade dog treat recipes. I don't know about you, but I remember how happy I was if my parents gave me a dollar for every A on my report card? Or when I did my chores, on time of course, it just made me want to do it again, right? That's positive reinforcement. Now dogs really don't care about money. BUT, they do thrive on praise… and food. 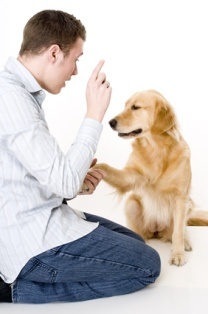 Positive reinforcement training uses praise and/or treats to reward your dog for doing something you want him to do. Because the reward makes him more likely to repeat the behavior, positive reinforcement is one of your most powerful tools for shaping or changing your dog's behavior. Hooray! It's a special day for either your puppy or maybe his best friend, Fifi the poodle. 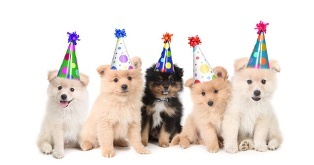 Let's get planning for a doggie birthday party with some of my delectable dog birthday cake recipes. OH YES YOU CAN make a dog birthday cake, it's a piece of cake! Get it, piece of cake, sorry no pun intended. Anyway, fido can be the bark of the party showcasing his cake with icing and all the party games and friends. You can make a cake, muffins, or even iced dog biscuits. You laugh, but really it's all possible. And don't forget to have parting gifts for your dogs guests. Find one of my homemade dog treat recipes, maybe the Peanut Butter Banana Carob Treats and whip up some of these home made dog biscuits. Then fill up a Chinese Take-Out box with tissue paper and your home made biscuits. Just like us, dogs can gain a ton of weight by being given too many treats that are full of calories. All dog treats are high in calories, doesn't matter if they are made at home or bought. That's the beauty of making home made dog treats, you can be in charge of your dogs weight management and bake dog biscuits that meet your dogs needs. Be very careful, don't just hand out treats to your puppy a number of times during the day. This can start stacking up the calories in a big way! Tip: Puppies love to make you happy, so require your puppy to do a trick for you like sit, down, roll over etc. before he gets his dog treat. Even when it's time for breakfast or dinner, I make my dogs sit before I put down their bowls. It's so funny to watch, Annie, one of our dogs, will sit without even being asked! That dog would eat endlessly if she had her way! She is however, quite the counter surfer. . . little brat. Ok, so are you ready? 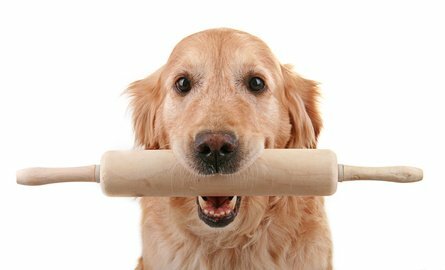 Come on, let's get you in that kitchen and start whipping up some healthy dog treats for your very best friend! Grab one of my homemade dog treat recipes and enjoy! Oh, and don't forget to let your pooch handle the quality control, tasting part that is! 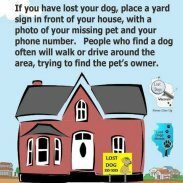 Your dog is waiting for you. . .